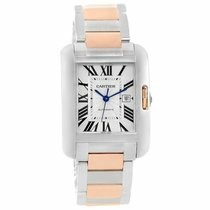 The Tank Anglaise is one of the fine members of a Tank de Cartier family. This particular model is 39x30mm, which is popular with women and men alike. 18K Rose gold accents on the crown and bracelet provide this watch with a touch of luxury. The classic White Roman dial is easy to read and accentuates that haute couture quality we've come to expect from Cartier. 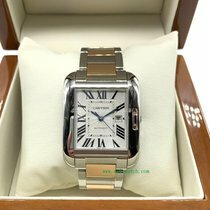 This watch comes complete with original Cartier box and papers.